We hope you can join us at our Business Breakfast on Wednesday 3 April at 7.00am. Our keynote speaker is former Wellington mayor, Rotarian and Tawa resident, Dame Kerry Prendergast. 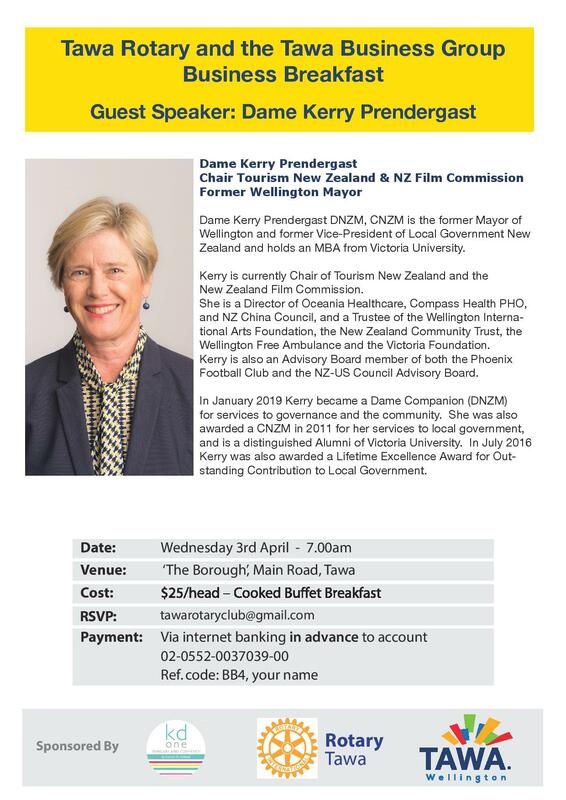 Kerry will speak about her role as chairperson of Tourism New Zealand, which promotes New Zealand as a tourism destination. Click on the image to access the PDF for registration and contact details. Our Rotary clubs are encouraged to donate to Riccarton Rotary - Mosque Appeal. ...From District Governor Marion Johnston,'Together we see a world where people unite...' It is important that at this time we stand beside those Rotarians and community members who are affected by Friday's tragic events and offer whatever support we can. See more. As Rotarians we hold core values of diversity, service, integrity, fellowship and leadership. We are acting now with all Clubs in our district encouraged to make a significant donation to a Rotary fund that has been set up to support the victims of this devastating attack. 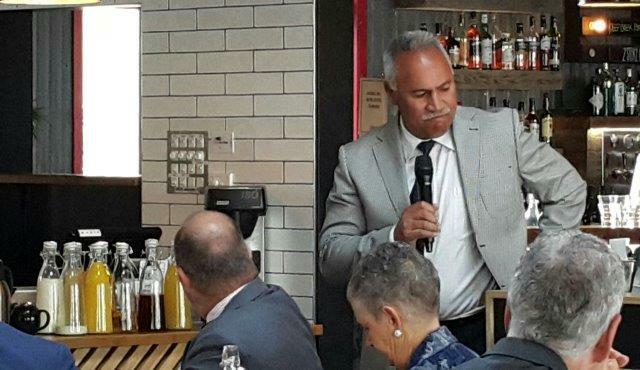 At a local level, the Rotary Clubs of Porirua, Plimmerton and Tawa joined the Porirua Multi-cultural Society and Mayor Mike Tana on Sunday for a Hui in support of the local Muslim communities affected by the Christchurch tragedy. The Horouta marae welcomed everyone with prayers, delicious kai and support of peace and love. Amidst the tears and sadness, all those in attendance were in praise and appreciation for the support received. Rotary is an international organisation that makes a difference in people’s lives on a daily basis, both locally and globally. Whether it’s topping up the food bank and supporting local youth, or funding international disaster relief, providing fresh drinking water to a village or working to end the scourge of polio (and we’re almost there). If you'd like to find out more about Rotary, or to talk over a coffee about joining Rotary, message us on Facebook or email Denise Garcia (Tawa Rotary President) at denisegarcia.tawarotary@gmail.com. 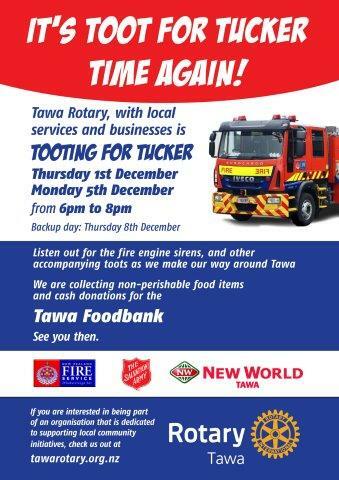 Thanks Tawa - great results from Toot4Tucker Foodbank Appeal! Thanks Tawa for your help with the annual Toot4Tucker Foodbank appeal! Great results from our collection with approx. 4490 non-perishable food items and cash donations totalling $1195-80. This community project is aimed at re-stocking the Tawa Foodbank prior to Christmas and New Year, particularly when demand tends to be high. The generosity of our Tawa community towards this annual foodbank appeal has been growing over the years since established in 2011. Find out more from previous years' collections. 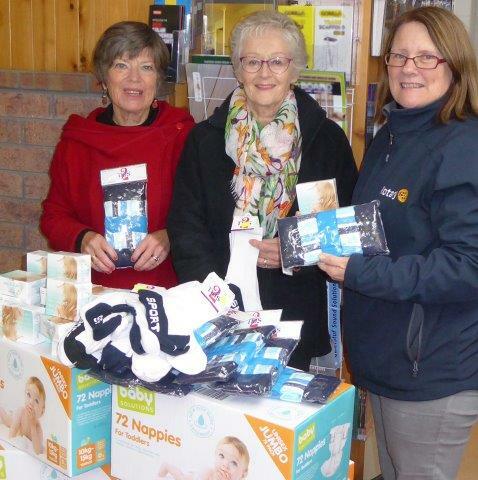 Almost 300 nappies and dozens of knickers, socks and shampoos were handed over to Foster Hope at Tawa ITM this week by Tawa Rotary President Denise Garcia (right) and Secretary Elizabeth Sutton (left). Mary Howarth (centre), representing Foster Hope, said the organisation was extremely grateful for these much-needed items. They would go into the backpacks of essentials for children going into foster care. Foster Hope is keen to replenish its stocks of coloured pencils, tampons, bibs, face cloths, shampoo and conditioner, face wash and nappy rash cream. 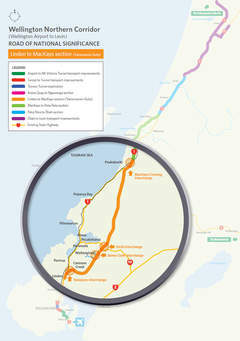 If you’re able to help out with any of these, please drop them off at Tawa Rotary’s collection point at ITM on Main Rd. See more. 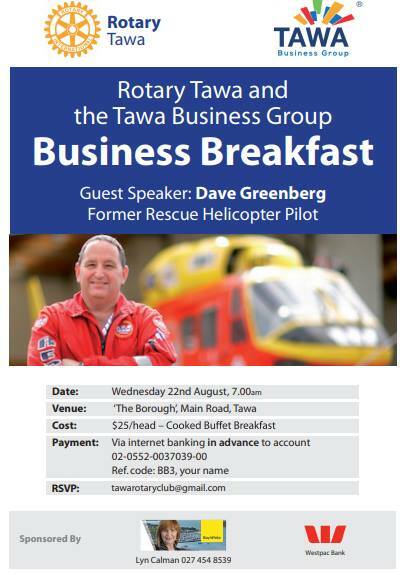 An excellent turnout at the Tawa Rotary Business breakfast on Wednesday 22 August at The Borough, Tawa. The speaker was Dave Greenberg, former Wellington Life Flight Trust. This event was co-hosted by the Tawa Business Group who helped with costs and marketing. Dave Greenberg shared fascinating insights from service in Life Flight Trust, that extend to trust issues in business. 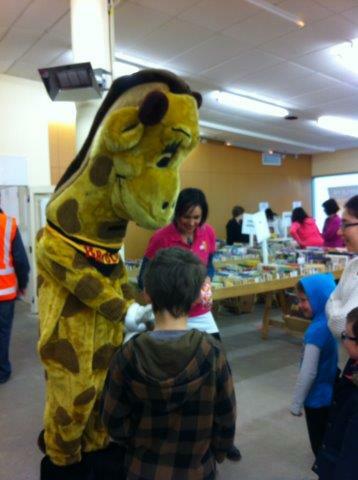 The Gigantic Tawa Rotary Book Fair this year was a great success - thank you everyone! A fantastic annual fundraiser for charity - that includes a contribution to the Life Education Trust (North Wellington). Diego Alcaino, an apprentice technician at Mexted Motors, was nominated for the energy and enthusiasm displayed in undertaking his workplace responsibilities. 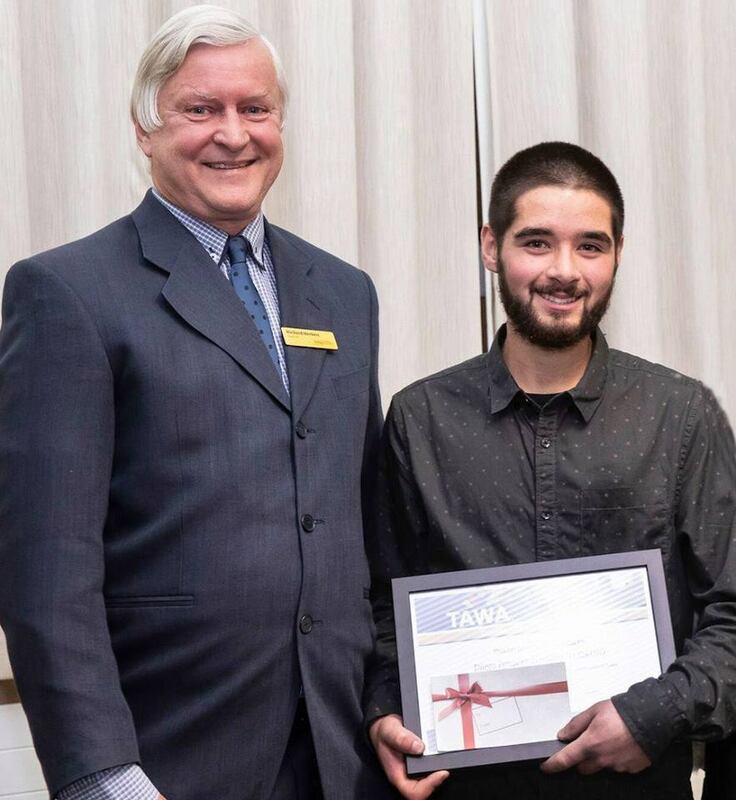 The Rotary Club of Tawa was pleased to be able to sponsor the Young Employee Award, which was run in conjunction with the recent Tawa Community Civic Awards. Diego is seen here with Tawa Rotary President, Richard Herbert. 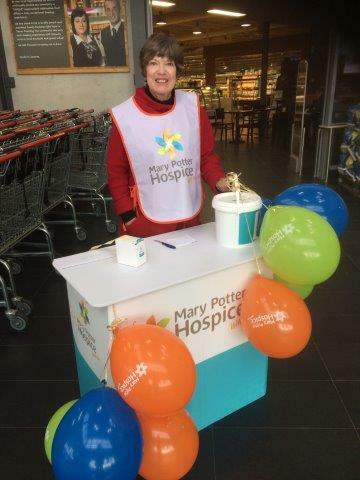 Tawa Rotary once again supported the Mary Potter Hospice annual street appeal on Friday (18 May) by collecting for them at Tawa New World Mall, with members of Inner Wheel collecting at Countdown. Money donated will be used to help provide hospice services for people at home, in aged care, in the Inpatient Unit in Newtown and in Day Hospices in Porirua and Kāpiti. Tawa Rotary in association with the Tawa Community Board are launching new Vocational initiative for 2018: The Tawa Young Employee award. Details regarding the criteria for eligibility may be found at the following URL: http://www.tawalink.com/tcca_rotaryaward.html and this page also provides a link to the downloadable nomination form that can be completed by the nominee’s employer. Employers in the Tawa, Linden and Grenada catchment - you may have young staff who could be eligible for nomination. Contact Don Rushworth at either drushworth@gmail.com or at 027 4907841 with any information you may have on employers who you believe have eligible young employees who could benefit from receiving such an award. 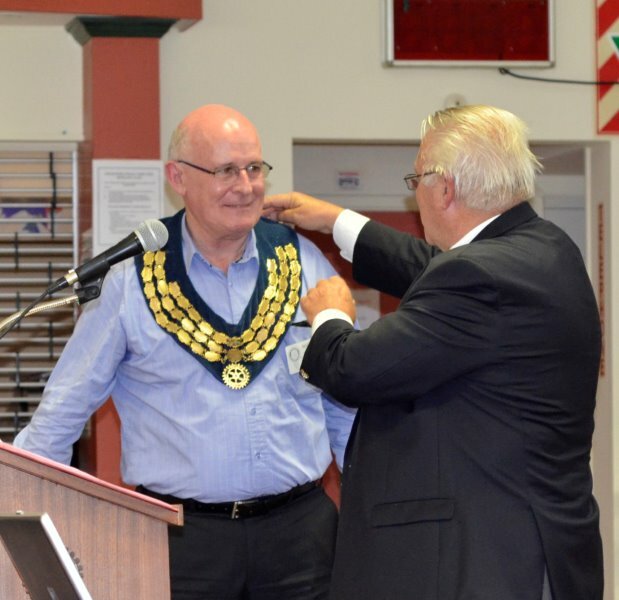 Our congratulations to Tawa Rotarian and Past District Governor Pat Waite on receiving Rotary's highest honour - the Service Above Self Award - presented by Rotary International President Ian Riseley on 6 March 2018. Outstanding news and very well deserved recognition of the significant time and talents that Pat has shared to help others. 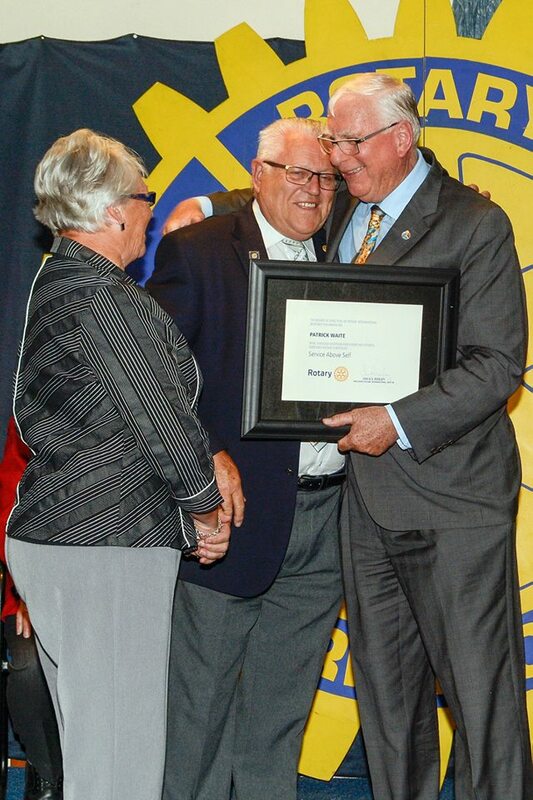 Photo credit - Svendsen Photography; from left, Melva Waite, Pat Waite and Ian Riseley. Want to know exactly what goes on at Centreport? Or how they are dealing with the aftermath of the earthquake? A successful night at Tawa Rotary hearing from guest speaker, CEO of CentrePort, Derek Nind. Derek spoke about challenges for CentrePort Wellington in the past and in the future and how he's addressing these. Derek’s career started in the South Island. He started at CentrePort in 2012 as General Manager, Commercial, just in time for the damaging 2013 Seddon earthquakes and then was promoted to CEO in 2015 just before the 2016 Kaikoura earthquake. Both sets of earthquakes caused damage to the port facilities. 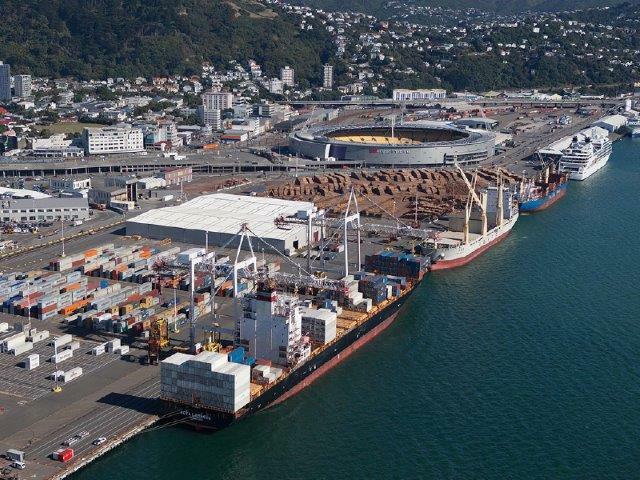 CentrePort is a key strategic asset for central New Zealand contributing significantly to the region’s GDP and supporting thousands of jobs. Derek explained progress that has been made to improve significantly resilience at the port and plans that are being made for regeneration. Thank you, Tawa, for your amazing support for the Foodbank appeal. You have restocked the Foodbank with 5688 food items – a whopping 73 per cent increase over last year’s contribution. As well, there was an increased cash donation of $824. 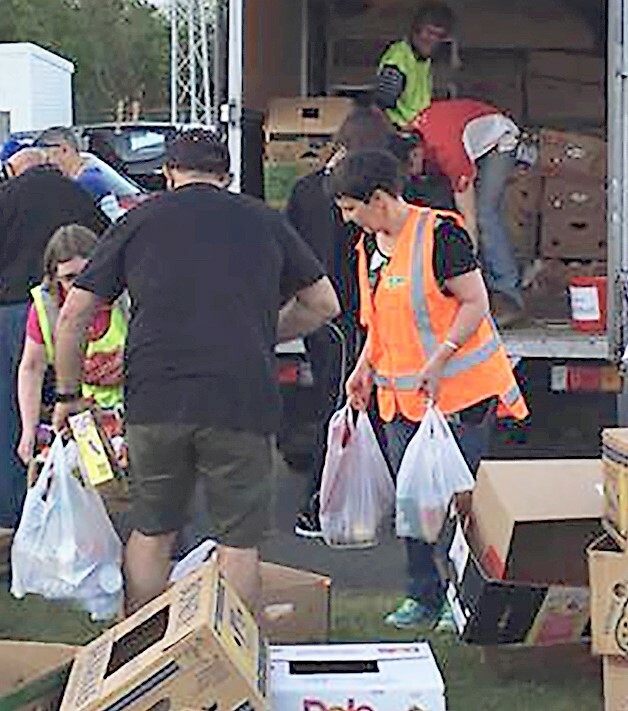 Thanks, too, to the supporting community organisations that provided collectors - Tawa Lions, Community Patrol, Scouts, Cubs, Ranger Guides, Inner Wheel, Salvation Army, the Volunteer Fire Brigade and to One Agency, Tawa New World and ITM. This is a community project that involves multiple service organisations in collecting for this worthwhile appeal. Find out more from previous years' collections. 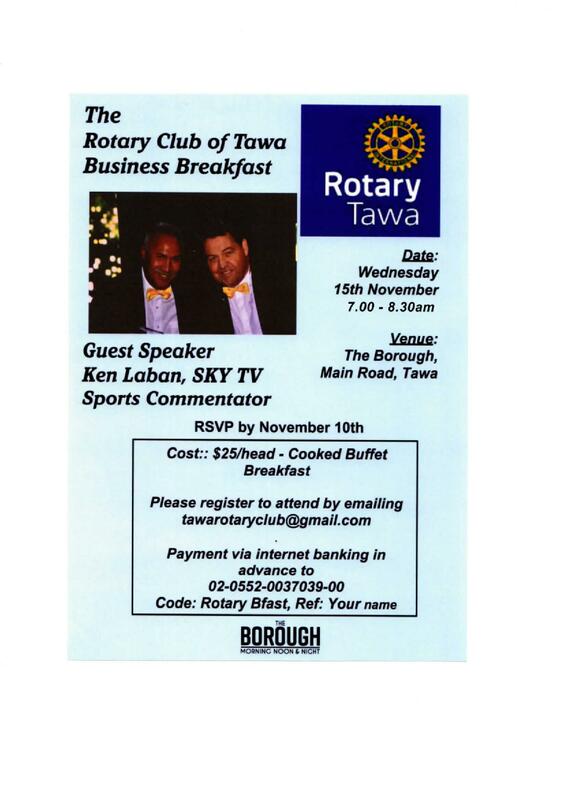 The second Tawa Rotary Business Breakfast was held on Wed 15 Nov. Guest speaker was Ken Laban, Sky TV Sports Commentator. Great to see people turn out for these business breakfasts and we look forward to gaining a sponsor to support such events. 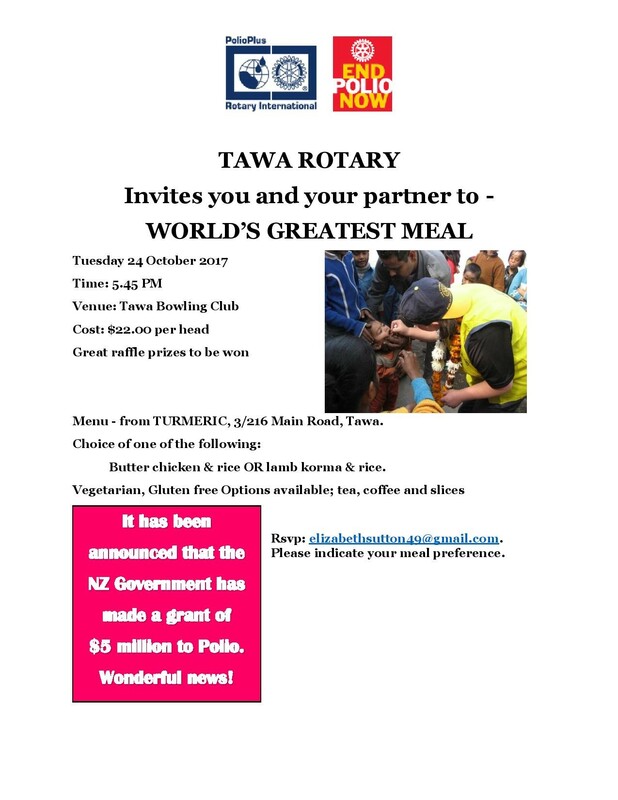 24 October - Tawa Rotary is raising funds to EndPolioNow! Thankyou to all Rotarians supporting this worthwhile evening. We have 62 people attending, and it should be a great night. The bar will remain open - evening commences at 5.45 p.m. Look forward to seeing you all. There will be entertainment, great raffle prizes to be won, and a delicious - either lamb korma or butter chicken with rice and roti bread to enjoy. You can dress with an Indian theme if you so desire!! The mighty Tawa Rotary Book Fair opened Saturday 7 October for you to stock up on your year’s reading. With thousands of books to choose from, there’s bound to be something for everyone. The weekend opening hours on 7-8 and 14 October are 9am-5pm, closing at 4pm on the last day. But if you are in the New World Tawa Mall and see the lights on during the week between, you are welcome to drop in to browse and purchase. And there’s a colouring competition for young children with new books as prizes. The book fair supports the work of the Life Education Trust in North Wellington schools. This is an important event in the life of Tawa Rotary and now represents our largest fund-raising opportunity for charity. See more. Thanks to our local community and Rotarians for contributing new pyjamas to children in care. Tawa Rotary is seeking your further help – we need beanies for children in full-time foster care to keep them warm. Young children living in care situations are away from family and they are relying on the generosity and goodwill of the community to help. Foster Hope NZ gives the beanies and pyjamas to these children (aged between 0-16 years). There are some 5000 children in foster care in NZ. Let’s support the foster parents to help keep the children and babies warm this winter. 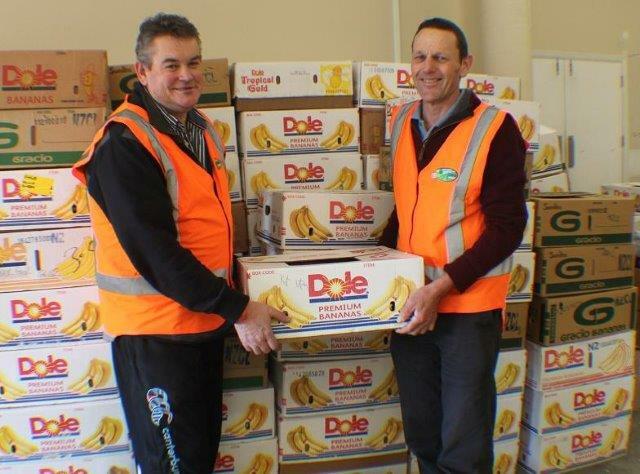 Tawa Rotary, Tawa ITM and Palmers Garden Centre are supporting Foster Hope’s winter drive. Please drop off the new beanies at Tawa ITM, 36 Main Road Tawa; or Palmers Garden centre, 71 Miramar Avenue, Miramar. About this community appeal, see more. 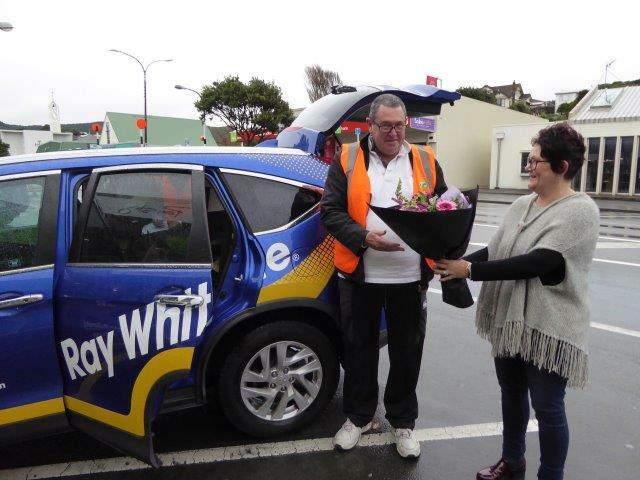 Pictured outside Tawa ITM - Tawa Rotarians handing donations to June Matthews from Foster Hope. Thank you Tawa community for another great year of contributions to Tawa Foodbank - Food items 3289; cash donations 784.40; plus cash donations from fundraising session at a joint Tawa Rotary/Lions meeting of 6 December to be included. Toot4Tucker led by Tawa Rotary was held on Thursday 1 December and Monday 5 December. 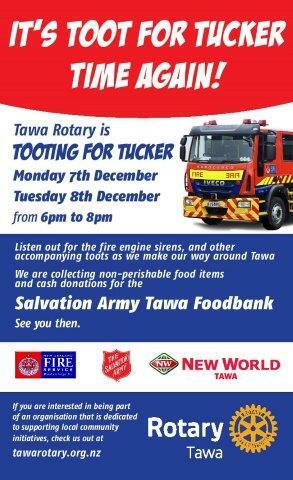 Toot4Tucker involves collecting non perishable food items and donations for Tawa Foodbank. Tawa Rotary is grateful for the participation in this significant community initiative as we travel through the streets - with the help of friends, family, local service organisations - the Tawa Volunteer Fire Brigade, Lions Club of Tawa, Salvation Army, Community patrol and support from local business - One Agency Brooking Realty and New World Tawa. All items donated go to the Tawa Food Bank. Contact is Laura Sommer, Tawa Rotary. For more information on this project and previous years' collections, see here. 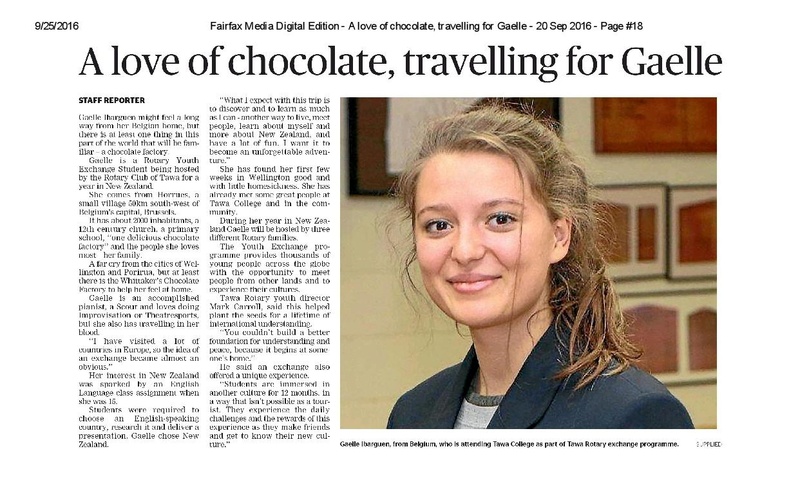 Gaëlle Ibarguen, Rotary youth exchange student being hosted by Tawa Rotary, has had an article posted in the Kapi Mana News on 20 Sept 2016 .A great introduction to Gaëlle and the benefits of the Rotary youth exchange programme. Book Fair in Tawa - A success! 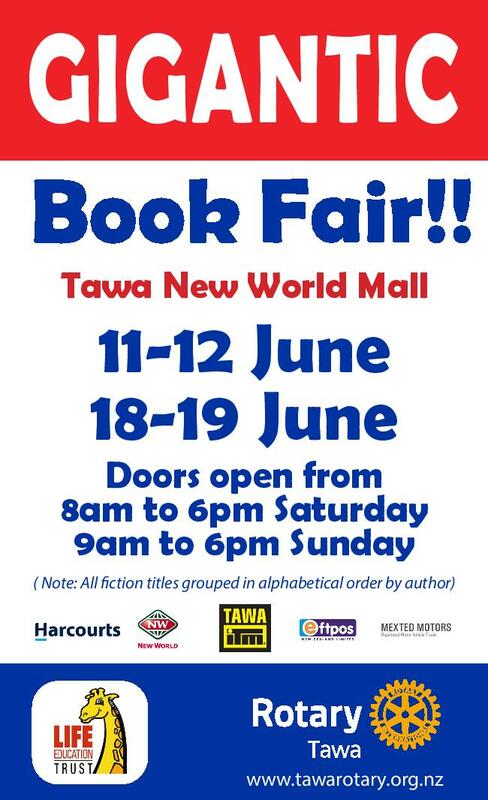 Our annual Book Fair was held once again at the Tawa New World Mall over the weekends of 11/12th and 18/19th June. This is an important event in the life of Tawa Rotary for raising funds that benefit our community. For many years the Rotary Club of Tawa has been running an annual book fair focused on raising funds by collecting and offering thousands of books, DVD's and CD's for sale. Half of the proceeds go to support the North Wellington Life Education Trust. This is one of many Rotary projects to support our local community. This year, a gross amount of approx. $25,700 was raised over the 2 weekends - thank you Tawa and visitors to our community who bought and donated books to this worthy fundraising venture. Perfect weather for a historic walk through Tawa that was held on Sunday 13 March. Tawa Rotary and Tawa Historical Society hosted the Southern Trail walk where Bruce Murray talked on 10 points along the route of historical significance. To find out more .. 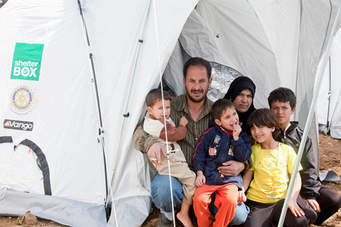 Encouraging news received on 7 January 2016 that the shelterbox has arrived in Syria. See more. 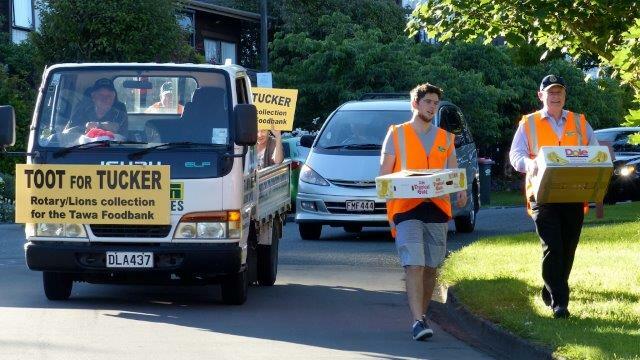 Toot4Tucker collection for Tawa Salvation Army Foodbank took place in the streets of Tawa on Monday 7 and Tuesday 8 December 2015. Tawa Rotary is grateful for the participation in this significant community initiative as we travelled through the streets - including friends, family, local service organisations - the Tawa Volunteer Fire Brigade, Lions Club of Tawa, Salvation Army, Cubs and Scouts, Ranger Guides, Community patrol and local business - Tawa New World and One Agency Brooking Realty. For more information on this project and previous years' collections, see here. Seeking future leaders to take up this fantastic sponsored development opportunity! Tawa Rotary is asking : are you 18-24 years old from Tawa? Have you demonstrated leadership skills in your community, workplace, field of study, sports code or volunteer capacity? Do you have a positive attitude? Are you a team player? Do you have aspirations and the drive to succeed? 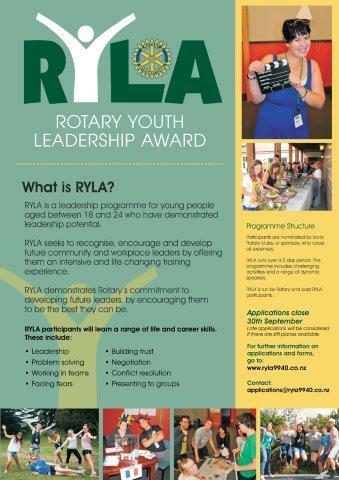 Rotary Youth Leadership Award (RYLA) is a five day residential high energy programme in January designed to develop lower North Island young leaders between the ages of 18 and 24. Hurry as late applications for 2016 are possible! Are you curious about this opportunity? To take advantage of this programme, find out more and apply here now. 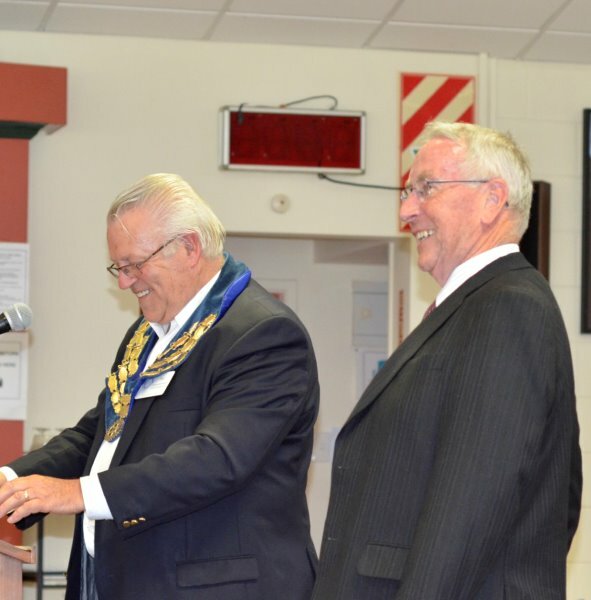 In an informal ceremony at Aquaheat Industries on 7 October 2015, President Ken Pearson of Tawa Rotary Club presented Anton Taylor with a $200 gift card as his prize for winning the 2014/15 Tawa Young Employee of the Year. Ken Pearson remarked that whilst it has taken a little while to present the award, he was absolutely delighted to finally ensure that Anton received his well-earned prize. Anton Taylor said that he was going to use the money to buy his girlfriend a birthday present and would put the rest aside. Pictured are from the left are: Pres Ken Pearson, Anton Taylor and Anton's supervisor, Tom Cane. Gigantic Book fair a success! Our Gigantic Book Fair has been a huge success this year, with literally thousands of books sold over two weekends raising much needed funds for Life Education Trust and charity causes supported by Rotary. President Ken Pearson and Chris Black - Community Services Director are pictured with boxes of donated books. Details about this significant community project are available here. Tawa Rotary President Martin Garcia is shown with a Shelter Box ready for delivery. More details are available here. Delighted to note that registrations for the Hats and High Tea event reached capacity - proceeds from tickets sold donated to the charity, Dress for Success. The event included a delicious high tea, the opportunity to pick up some styling tips gleaned from the dressing programme at Dress for Success, a charity that helps women with attire for interviews. Guests also found out about 2 recent Tawa community projects. Details on this exciting event held on 24 May 2015 are available here. 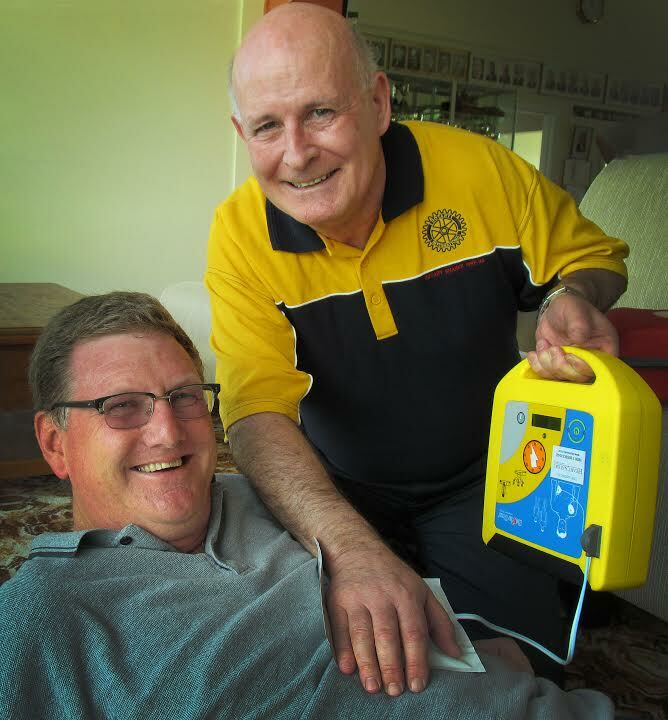 Tawa Rotary Club has been looking for projects that will help the residents of Tawa, and will particularly help people’s health and fitness. The photo shows Martin on the right trying the equipment out on the Tawa Bowling Club President Grant Traill (left of photo). Pictured from left to right are Tawa Rotarians - Gaylene Lines and Past President Irene Corpuz - and Longview Activities Coordinator, Marlene Bowles and Clinical Nurse Manager, Michael Nestmann. New year - new members! 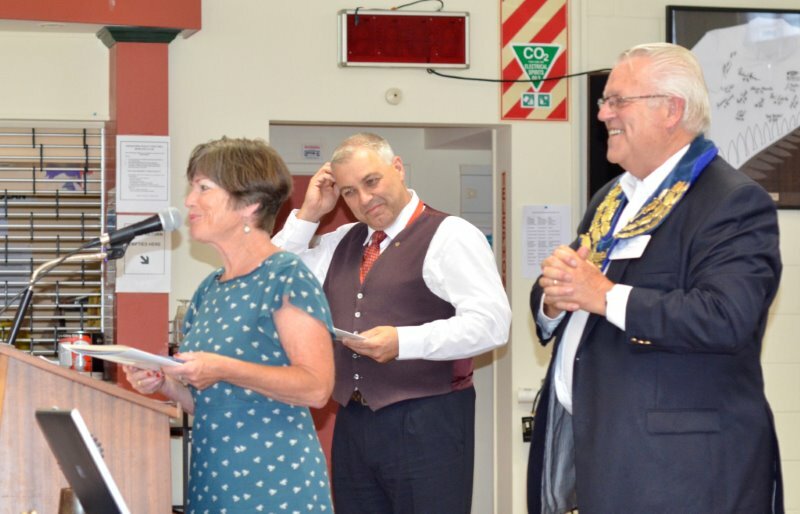 As we return from the Christmas/New Year break, we've welcomed 3 members to Tawa Rotary in January. Incoming President (District Governor nominee) Martin Garcia has posted his first message for the new calendar year. 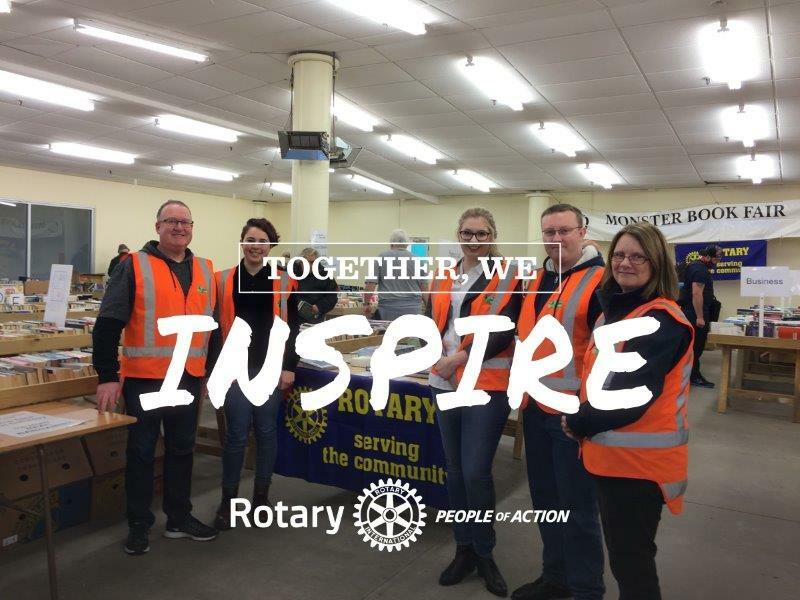 Are you up-to-date on what's happening in Tawa Rotary? - keep reading. 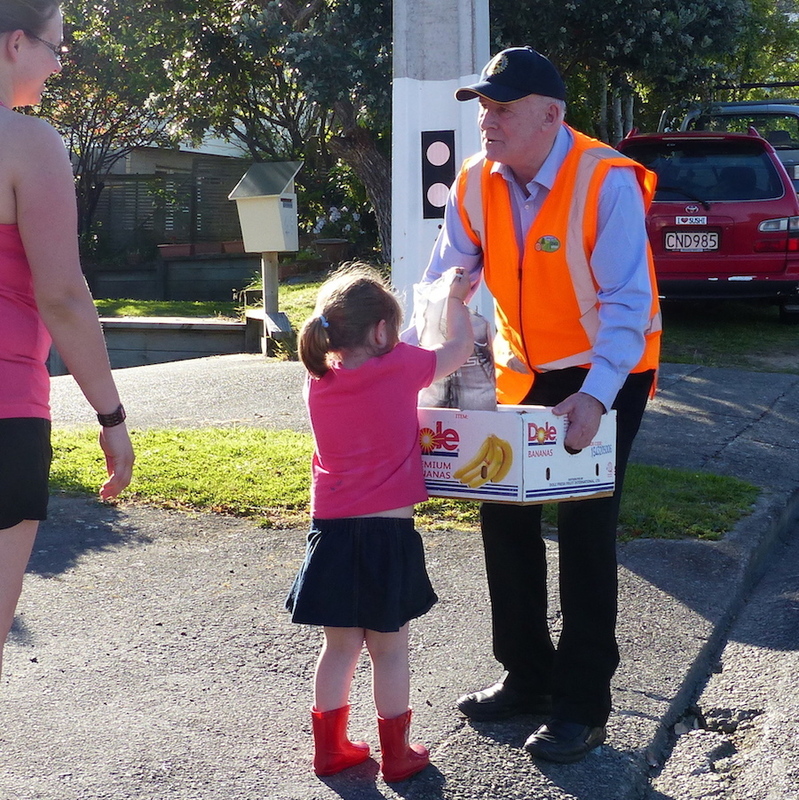 The generosity of our community has been evident through their participation in Christmas events hosted by Tawa Rotary- Carols at the College, followed by the Toot4Tucker street appeal for Tawa Foodbank. Christmas celebrated at Tawa College with local entertainment provided by musicians participating including the Porirua Trust Band, the TUI Ukelele Band, Charlotte Murray, Linden School - followed by a reading from Major Keith Wray of Tawa Salvation Army. MC (and Past District Governor) Howard Tong did a great job encouraging us all to prepare for Santa's arrival - while he led the singing and read a Christmas story. Oh what joy when Santa arrived on the fire truck! Early contributions of cans and cash towards Tawa Foodbank were donated by patrons. Toot4Tucker Appeal - fantastic results! The Life Education Trust’s mobile classroom, with Educator Bec Kaukau and Harold the Giraffe visited Linden School last week. The Trust provides information to primary school children on a range of life choices they will face which include those of drugs, alcohol etc. Included in the photo with some very lively children are Bec Kaukau, Pat Waite, President of Tawa Rotary Club, and Allan Nichols, Chairman of the North Wellington Life Education Trust. Pat Waite said the Life Education Trust provides invaluable information and answers to young people as they think about the choices that they have ahead. He said Tawa Rotary was pleased to again provide $9000 to the Trust, which was raised at the Club’s annual Book Fair. “Young people are our whole future”, he said. 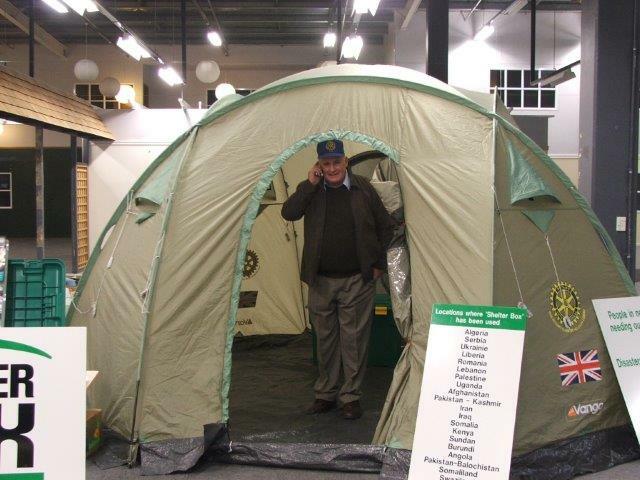 Allan Nichols said the North Wellington Trust mobile classroom visits over 6000 children at 35 schools each year, and relies completely on donations received, including from Rotary Clubs in the area. The children have fun while they learn. “ Look at their happy faces” he said. “They enjoy the humour and fun, particularly with Harold the Giraffe, but they are also really looking for honest advice and information on lifestyle choices ahead”. Dr. Rod Ferguson, with Tawa Rotary Past President Irene Corpuz, is shown trialling the operation of the new equipment. He said “this will replace our old previous equipment and will enable Doctors, Nurses, and staff at the Linden Surgery to respond very quickly if a patient or a member of the community requires urgent CPR.” See more. Councillor coping well under pressure! 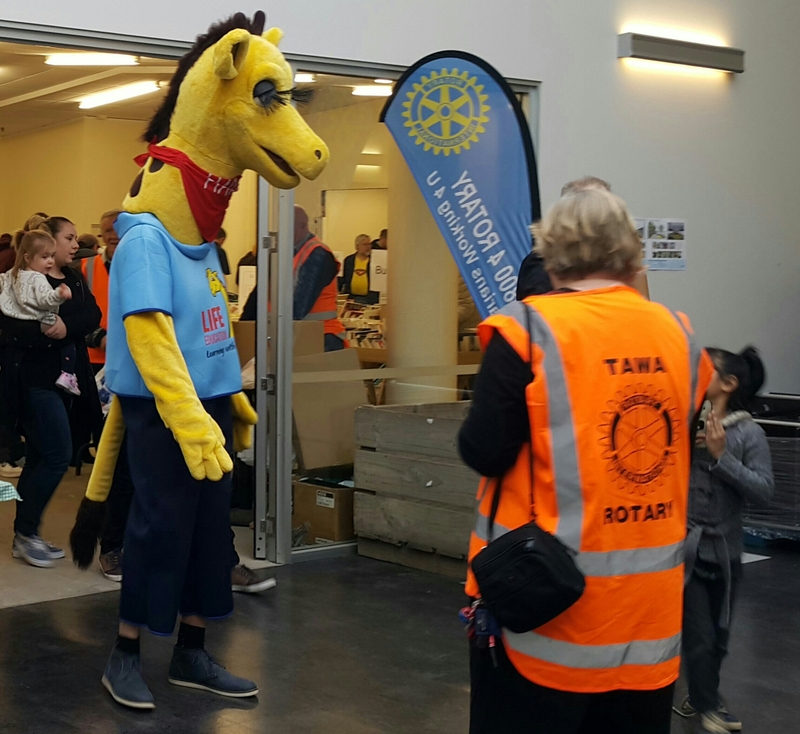 On Saturday 4th October, Tawa Rotary Club members assisted Tawa Medical Centre and the Stroke Foundation with the 2014 Blood Pressure Awareness Campaign. At New World Tawa and New World Porirua, many people had their blood pressure checked for free by medical staff. Malcolm Sparrow, Wellington City Councillor and a member of the Tawa Rotary Club, is shown having his blood pressure taken. Find out more. New World Tawa provided their Van for use in last December’s Toot 4 Tucker collection, where we collected food gifts and donations from Tawa residents for the Salvation Army’s food bank. Select this link to find out more. Our annual fundraiser - the Tawa Rotary Book Fair - has been held over two weekends in late June/July. A great selection of books, DVDs, etc have been available to choose from. Proceeds from the sales go to Life Education Trust (Wellington North) and other charitable causes. We are welcoming new and returning members to Tawa Rotary. People in our community who want to contribute their time and skills to worthwhile projects that benefit local and global initiatives like the Tawa Rotary Local Employee of the Year Award and the End Polio campaign; and who enjoy each other's friendship. Want to find out more? - get in touch. 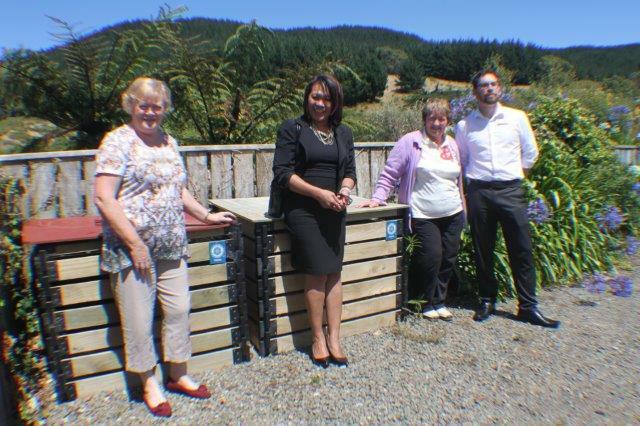 Rotary making a difference in Horowhenua! What does an orientation training session, over 25 prospective mentors and a very knowledgeable trainer, have in common? 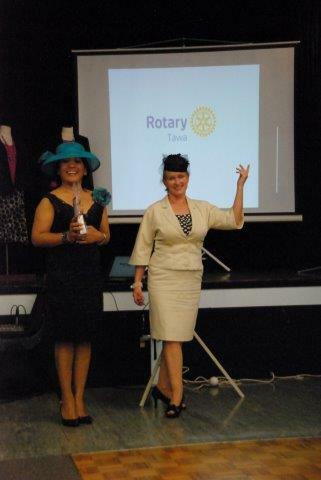 d'Arcy Lunn visited the Rotary Club of Plimmerton in March 2013. He is a perpetual volunteer who works with the Global Poverty Project. He is passionate about ridding the world of the scourge of Polio and has recently written from Uganda. Read his contribution on Our Communities page or go directly to his Blog post here. Original generation time 1.1922 seconds. Cache Loaded in: 0.0350 seconds.